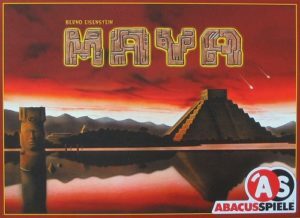 This ‘big-box’ game from Abacus is called Maya and takes us back to the heyday of the Mayan culture. Players take part in the construction of pyramids in centers such as Chichen Iza and Palenque, in order to receive the greatest portion of gold from the Mayan leaders. However, the help of workers is required to quarry and transport the stones required for the pyramids to the building sites. Maya is a tactical card- and building-game. It is published in the well-known Abacus box – the same sized box as Emerald or Canyon. The game is the first published title by me. Editing of the game was performed by Grunspan.